Following is the photo of a Pteranodon (a genus of Pterosaurs which included some of the largest known flying reptiles) which, according to FSB 20, had been for some time claimed to have been photographed by Meier during his trip to a galaxy that is 9.38 billion light years away. This picture for reasons that will be discussed later wasn’t included in the 7 pictures published in PPKB 1 in 2002. For an uncropped version of this photo, see this picture which is taken from a video presentation of Randolph Winters about the Meier case given at SHIFT (Sharing Information on Fringe Topics – a speakers forum in San Francisco Bay Area) in April 1998. In this presentation, Randolph Winters plays a video tape which he recorded using his camcorder when he was at Wendelle Steven’s home around 1987 or 1988 (personal correspondence with Randolph Winters), with both of them flipping through Wendelle’s photo album containing Meier’s pictures from his space journey. It should be mentioned that FIGU had already distanced itself from Randolph Winters by the time of this lecture, as becomes apparent from an article (Angebliche Plejadier-Kontakte in Miami/USA – Neue Lügen- und Betrugsgeschichte von Randy Winters) from Stimme der Wassermanszeit no. 99 from June 1996; so the content of the lecture should not be considered as being representative of FIGU’s point of view . This same uncropped version is also seen on page 251 of Kal Korff’s 1995 book – ‘Spaceships of the Pleiades’. Kal Korff received this picture as a part of a photo album/binder containing more than 60 pictures of Meier’s space pictures, which was freely handed over to him (in 1995) by ex-FIGU member Hans Jacob’s family as Hans Jacob had already died in 1989 in a hospital. Hans Jacob had been the official organizer/safe-keeper of Meier’s photo and video material for a long time before he left the Meier group in 1977. In his 1995 book – Spaceships of the Pleiades – Kal Korff criticizes two of Meier’s dinosaur photographs (pg. 250) where he addressed that they are out-of-focus, which when considered with the purported optical characteristics of Meier’s camera, according to Korff ‘makes no logical sense.’ On pg. 251, Korff presented a page from Wendelle Steven’s unpublished ‘UFO Contact from the Pleiades: A Preliminary Investigation Report’ manuscript showing two other dinosaur photographs, one of which is the picture of a Pteranodon (top image). Korff claims that these two ‘damaging photos’ have been omitted when Wendelle Stevens published his book. 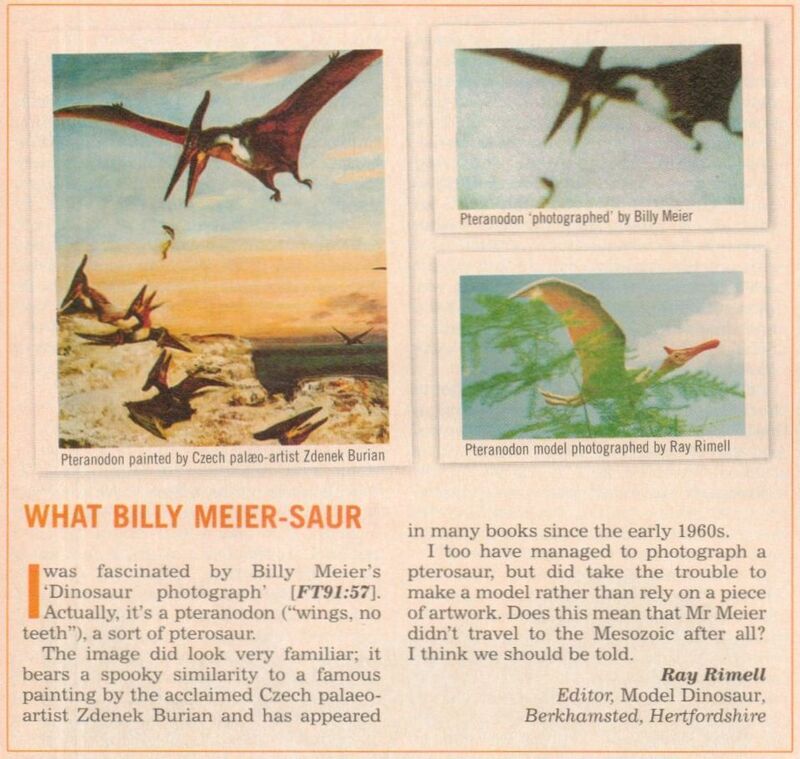 In a later edition of Fortean Times, #98 from May 1997, under the ‘Letters’ section (see below), Ray Rimell, an Editor of ‘Model Dinosaur’ (a newsletter for modelers), Berkhamsted, Hertfordshire, England, pointed out that the Pteranodon published in the #91 edition “bears a spooky similarity” (see this animation and comparison picture) with a famous painting of a Pteranodon that ‘has appeared in many books since the early 1960’s’, made by the acclaimed Czech palaeoartist Zdeněk Burian. In fact the painting was made by Zdeněk Burian in 1960 and was first featured in a book ‘Prehistoric reptiles and birds’ published by a Czech paleontologist Josef Augusta in 1961. Derek Bartholomaus, a former member of the Independent Investigations Group (IIG) also have found (though not the first person) this painting in one of those books (which Ray Rimell noted) titled – ‘Life before man‘ – written by Zdenek V. Spinar and published in 1972, 3 years before Meier allegedly made the pictures during his Great Journey. On June 25, 1997, Heidi and Bob from the US wrote a letter to Meier in which they included the small article by Ray Rimell from Fortean Times #98. This letter is answered by Meier on June 30, 1997. In CR 260 (February 3, 1998) both the letter as well as Meier’s answer are included and discussed with Ptaah, who explains that many of Meier’s Great Journey space pictures have been manipulated or exchanged with forgeries by a photographer named Schmid from the Rhine Valley (to whom Meier has given a large quantity of his negatives/slides for development of photos and film) and also by ‘several other people both at home and abroad.’ Meier further states that before he was made aware of the fact that many of his pictures have been falsified, he had distributed these pictures, including the Pteranodon picture, among his FIGU group members as copies of authentic pictures from his space journey. After becoming aware of the falsifications, Meier added that ‘Quetzal took all the material (BMUFOR note: from Meier) and destroyed it, through which greater harm should probably be avoided.’ It was not mentioned when exactly Quetzal took all the material from Meier and destroyed them. However, according to the UFO researcher Ray Stanford, this happened in 1978. “91. Concerning the dinosaur images that were addressed in the letter to you, it seems to me, as you mentioned, that something isn’t right, for as I see, the two images aren’t exactly alike. Meier never took the picture of the Pteranodon that is attributed to him on the planet NEBER. Later, when Quetzal inspected the space pictures, especially the dinosaur pictures, he noticed that dozens among these pictures quite clearly could not have come from the planet NEBER and, therefore, had not been taken by Billy, about which Quetzal got very angry and destroyed all of them (along with ~1,462 others) including the Pteranodon picture. Ptaah explains that out of the more than 1,378 pictures from Meier’s Great Journey, only 42 really come from Meier, while the majority of the 1,336 pictures consisted of foisted photocopies of some drawings, etc., which Quetzal discovered very quickly at that time and later destroyed all slides and photos. The so called “Men in Black” (MIB) had forced the photographer Schmid to falsify Meier’s pictures from the ground up or replace them with forgeries, which also happened with the Asket & Nera photos and with the Pteranodon photo. 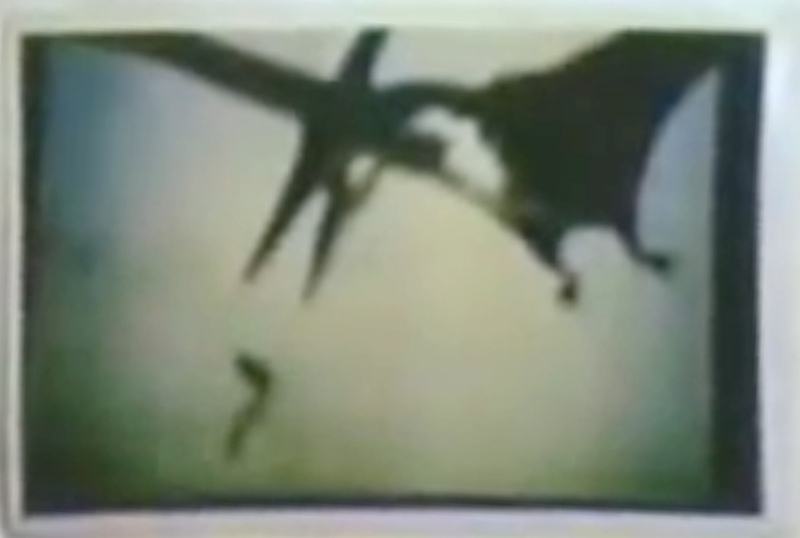 Meier’s ex-wife Kalliope as well as other group members, to whom many manipulations in the film, slide, negative, and photo material have been attributed, have deliberately brought the falsified Pteranodon picture into circulation already before their destruction – with the malicious intention of letting Meier appear as a swindler and a fraud. 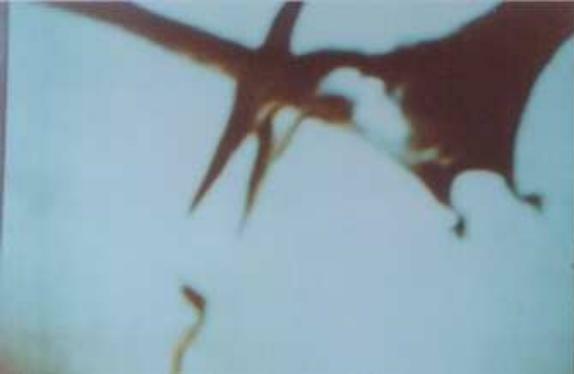 In CR 260 (1998) Meier reports that according to Plejaren, the Pteranodon picture that has been attributed to Meier might have been a forgery and since they have destroyed ‘all the originals and copies of slides and negatives, etc.’, they can no longer investigate and state anything conclusively on the picture. But according to FSB 20 (2005), Meier reports that that the Pteranodon photo has already been detected to be nothing but a forgery since the middle of 1970’s by the Plejaren. 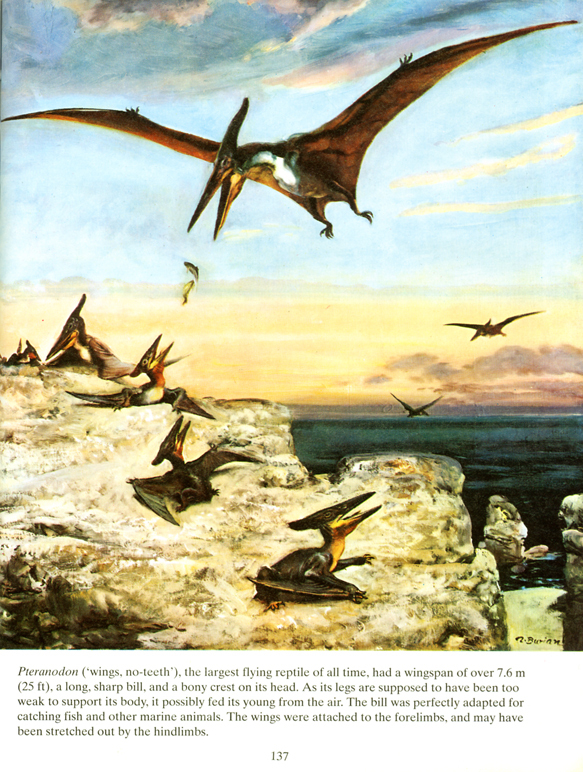 Also in CR 260 both Meier and Ptaah claim that they have found ‘at least two striking differences’ between the picture that was attributed to Meier and a Zdenek Burian’s painting of a Pteranodon. In reality a simple visual comparison between those pictures reveals that there are no ‘striking’ differences at all. The picture that is attributed to Meier is exactly the same as the painting albeit in a much lower quality and resolution. In FSB 20 Meier/Plejaren agree with the statement made by Hans George Lanzendorfer that the Pteranodon picture that was attributed to Meier ‘had obviously been photographed from a book (…).’ Why couldn’t they state this simple fact in CR 260? Why was it so obvious in 2005 but not obvious in 1998? We have looked into the picture of a Pteranodon that originally was distributed by Meier among the members of his group, FIGU as a genuine one photographed on a planet called NEBER, 9.38 billion light years away. But in 1997, it was revealed that Meier’s picture is identical to a painting of a Pteranodon made by a Czech artist named Zdenek Burian, reportedly in 1960’s. Then in 1998 (CR 260) Meier reported that the “Men in Black” (MIB) have forced the photographer Schmid (to whom he gave negatives/slides for development) to falsify hundreds of Meier’s space pictures from the ground up or replace them with forgeries, as this also happened with the Pteranodon photo. 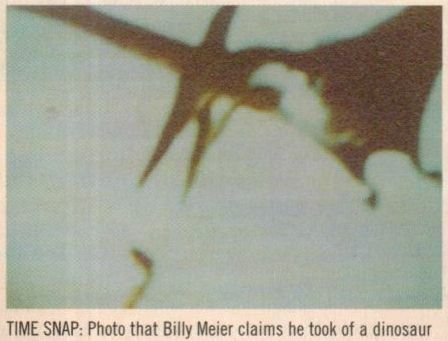 Meier then claims that as soon as these manipulations were detected by Quetzal ‘in the middle of the 1970s’ (according to Ray Stanford it is 1978), all the originals and copies of them including the Pteranodon photo have been immediately taken away and destroyed by Quetzal to save Meier from causing anymore damage to him. But the aforementioned inconsistencies and peculiar statements casts doubt on Meier’s claims regarding the Pteranodon picture.